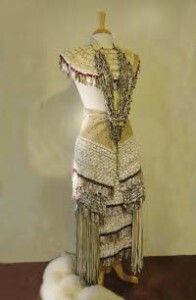 This exhibition is a small portion of an intricate collection of magnificent traditional and contemporary works by Callie Lara over many years. 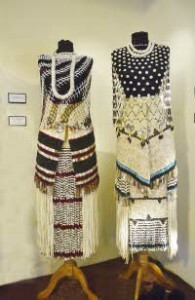 These are traditional and contemporary pieces for the ceremonies of the Hupa, Yurok, and Karuk tribes. Callie, her husband, Walt Lara, Yurok, and their daughters, Keduescha, Kishan, Elizabeth, & Roberta, relatives, and friends have dedicated their lives to the revitalization of ceremony and a traditional way of life among the Native peoples of the Pacific North California Coast. Callie is a student of the Hupa language and a Hoopa Tribal member with Karuk ancestry.